I'll be honest with you, space combat in TOR may be a game breaker for me. The tunnel shooter had it's time, and was fun in it's time. Probably the earliest SW tunnel shooter that I wasted many a quarter on in the early to late 80's, hell even into the 90's, was the old Star Wars vector graphics cockpit arcade game, best SW fighter game ever, IMHO. To be honest, STO is the best example of MMO space combat out there. It is full free flight 3D epicness. This is what space combat should be, where you need to be aware of what's above and below you as well as to the left, right, front and rear of you. Ship customization is second to none. Actually, Cryptic leads the pack with the amount of customization in their MMO's. Give it a second look if you haven't, it has more of a Trek feel now than it ever did. Rail combat is a one or two dimensional system set in a three dimensional environment. In other words, a 3D side scroller except from a third person perspective. My question is, how will space PVP work when you're on rails? DarthBelan wrote: To be honest, STO is the best example of MMO space combat out there. It is full free flight 3D epicness. This is what space combat should be, where you need to be aware of what's above and below you as well as to the left, right, front and rear of you. Ship customization is second to none. Actually, Cryptic leads the pack with the amount of customization in their MMO's. Give it a second look if you haven't, it has more of a Trek feel now than it ever did. Space Combat in STO was perhaps the one thing that turned me on to the game; I'm with you on that (though in fairness to the concept, it felt like the Pirates of the Burning Sea system in three-dimensions). As far as customizations, though, I think it can be taken too far. I slammed my forehead onto my desk when I saw a player that looked like Frylock with legs and arms. You probably refer mostly to invisible elements, like stats of a weapon, but I feel it's two sides of the same coin. Too much player freedom often isn't a good thing. Observe Star Wars, and you find two types of space combat: linear and free-range (a third type might be free-roam, like Eve, where you could go literally anywhere if you choose). When Star Wars centers on one person's story, it is linear. Examples: Death Star trench (Luke), Rescue Senator Palpatine (Obi-Wan and Anakin). When Star Wars centers on several stories, it is free-range. Examples: Battle on Hoth, Deathstar Above Endor. 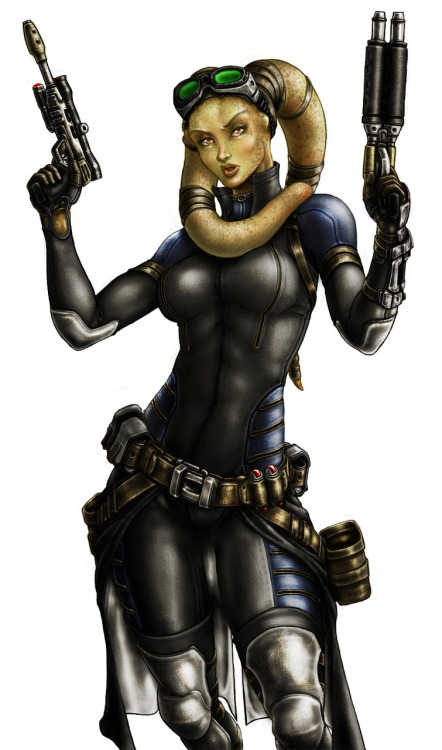 This is what I expect to see in SWTOR. The soloable story content would be StarFox-style (possibly including the occasional 'all-range' battlefield); free-range content would be available for groups. I do not expect emphasis on space travel like STO or Eve, as Star Wars always seemed more focused on ground operations, to me. I don't recall a single instance where someone dropped out of hyperspace early to explore! Bioware has examined all sorts of games, asking themselves what made them so fun and effective. If something was fun in the 90s, why can't it be fun now? We must all keep in mind that, as they said on this episode, Bioware has only shown us a small portion of content. As for the Battlefront II style PVP - not bad. But they would have to stray from the concept of a tunnel shooter and make it more epic. Let's face it, all you do in battlefront 2 is fire bombs or torpedos at a cruiser and do a 180° turn whenever you get too close or get focused by another fighter...and baaam...the enemy cruiser is down....it just doesn't feel epic. Dileptor wrote: Let's face it, all you do in battlefront 2 is fire bombs or torpedos at a cruiser and do a 180° turn whenever you get too close or get focused by another fighter...and baaam...the enemy cruiser is down....it just doesn't feel epic. Your right, it doesn't. But I am sure that whatever BioWare does with Space Combat in SWTOR will be fun and worthwhile. That's how Lucas Arts (? and Pandemic or Activision? I'm confused. It says all of those on the cover) did it. Maybe Bioware will do better. I would welcome that. I agree with you but I must disagree that STO would represent the kind of space combat we have in Star Wars. STO is capital ship fights slow lumbering vessels battling it out, its WW2 navel combat in space. "Its all bring the guns to bear" and what not. In Star Wars you'll be in a smaller fighter or light freighter. So the rail shoot works for now. vinnypop wrote: I agree with you but I must disagree that STO would represent the kind of space combat we have in Star Wars. STO is capital ship fights slow lumbering vessels battling it out, its WW2 navel combat in space. "Its all bring the guns to bear" and what not. In Star Wars you'll be in a smaller fighter or light freighter. So the rail shoot works for now. I can see how you think I implied that, but I made no such declaration. Since you bring it up, you speak of capital class ships and STO. If we ever pilot such large vessels, I think STO-style would fit really well. We hear "we've lost our starboard deflector shield" all the time in Star Wars -- same for Star Trek. You are certainly right that the tactical nature of STO combat is less applicable to small fighters that depend on piloting skill and reflexes. At its core, though, STO combat is a slower-paced free-range space combat, which has elements applicable to any free-range combat. You know, every time I watch Open Bounty's opening, I am reminded of the opening to "Big Shot" on my favorite anime series, Cowboy Bebop. Problem is... while you guys DO put on a great show, you're no "Judy." Great episode. I'm really enjoying these Open Bounties. I hope for a mix, like others have said, where single-player encounters are tunnel shooters, with co-op/PvP (possibly down the road) would be more open, at least, if not completely open. DarthBelan wrote: I agree with you but I must disagree that STO would represent the kind of space combat we have in Star Wars. STO is capital ship fights slow lumbering vessels battling it out, its WW2 navel combat in space. "Its all bring the guns to bear" and what not. In Star Wars you'll be in a smaller fighter or light freighter. So the rail shoot works for now. WWII was the first war with small things having effect in naval war with aircraft carriers and topedo boats if you want slow ships blowing the hell out of eachother u got to go back to 18th cent where ships of the line sailed round and anything small got ignored due to the fact it was unsporting to destory them in a major battle.